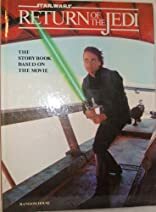 In a sequel to "The Star Wars Storybook" and "The Empire Strikes Back Storybook", Luke Skywalker and his friends in the Rebel Alliance formulate a daring plan to battle with the Empire and its evil leaders, Darth Vader and the Emperor. About Joan D. Vinge (Author) : Joan D. Vinge is a published adapter, author, and a translator of children's books. Some of the published credits of Joan D. Vinge include The Random House Book of Greek Myths, Lost in Space.